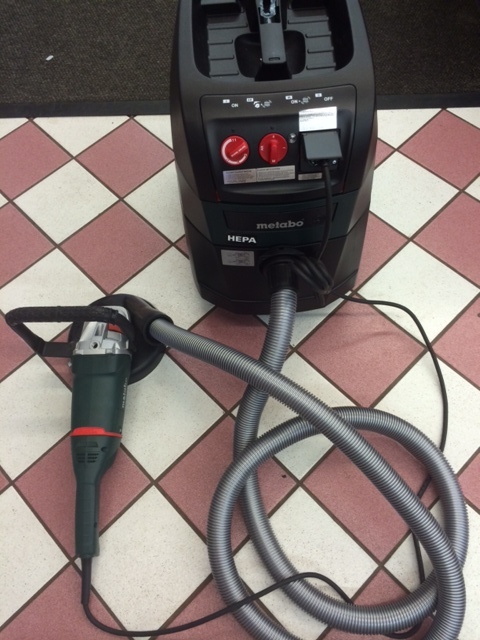 METABO HAND-HELD GRINDER COMES COMPLETE WITH : METABO HEPA VACUUM & DISPOSABLE BAG - CRUSH RESISTANT HOSE - RUBBER VACUUM SHROUD - DIAMOND CUP WHEEL. GREAT FOR CONCRETE SURFACE PREPARATION - REMOVAL OF PAINT - GLUE- EPOXY - SEALERS- OIL STAINS- THIN SET CEMENT- GROUT AND OTHER CONTAMINANTS. * Please call us with any questions about our grinder concrete hand held w/vacuum rentals in South St. Paul MN metro area.